Jackie Cameron and her assistant Elaine Boshoff put the five students of the Jackie Cameron School of Food and Wine through their paces in the student kitchen. “Cooking is like dancing, ” says chef Jackie Cameron, “it’s well choreographed, you need good communication skills and it’s a team effort.” This is certainly true of the chef’s latest project, the Jackie Cameron School of Food and Wine, which recently opened its doors in Hilton, just north of Pietermaritzburg in KwaZulu-Natal. Located in her former family home, the project has definitely been a team effort, with her sister Sheldeen Cameron and parents John and Mauveen getting stuck in, not to mention giving up their home to accommodate their daughter’s longheld dream. Jackie was formerly the award-winning head chef at Hartford House in the Midlands for 12 years, finishing on a high note at number five in the country at the 2013 Eat Out DStv Food Network Restaurant Awards. She has been collecting bits and pieces for her school for years, from the wooden wine storage boxes and Riedel glasses guests will find in the temperature-controlled wine cellar (where they will be able to store their wines under lock and key), to the tables in the function venue and dining space, located in the Camerons’ former dining room. It is now furnished with wild teak tables made by local manufacturer Homewood and decorated with bonsais, a tribute to Jackie’s late grandfather who grew his own. And then there’s the view – a sweeping vista over the undulating KZN hills framed by a spectacular glass wall, which diners will be able to admire over dishes cooked and demonstrated by the school’s five students, once they’ve mastered the art of a perfect beurre blanc or soufflé. The dining space is presided over by the gleaming, newly installed, state-of-the- art, imported French Charvet kitchen, designed and installed by The Culinary Equipment Co. Everything was made to measure and customised according to Jackie’s specifications. This is what delayed the opening of the school to April this year, but quality takes time and is worth waiting for – it has by no means dampened anyone’s spirits. Award-winning chef Jackie Cameron recently opened her School of Food and Wine in her former childhood home in Hilton, KwaZulu-Natal; the students, from left, Kate Cousins, Carla Schulze, Cara Conway, Emily Schmidt and Rai-Teree Dass, in the state-of-the-art function venue kitchen. The 18-month-long internationally accredited course, which includes a year at the school and a five-month industry placement, aims to prepare students for working in a restaurant and to expose them to a wide variety of aspects of working in the food industry. It spans practical necessities such as first aid and fire-fighting, French terminology and culture (taught by a French linguist) and cake decorating by award-winning cake decorator Pam Alty. There's also a wine component taught by Cathy Marston of the Institute of Wine and Spirits (accredited by the internationally recognised Wine and Spirit Education Trust) and a trip to the Cape to understand wine-making and viticulture. Students will also meet local producers and be taught how to run the financial side of things by an accountant. “Think of it as newage teaching – I want to prepare them and give them the skills and confidence to make it in the industry,” explains Jackie. The students will emerge with an internationally recognised diploma from City & Guilds. They will also be responsible for growing their own herbs and vegetables in the garden to understand growing their own produce and true farm-to-table principles. Jackie aims to have an on-site “wetland” that will filter water, eliminating the need for chlorine in the school’s water supply in the near future. The students, and their Wonderbags, outside the school, with the lecture room on the ground floor and the student kitchen on the second. Petit-fours made by Carla Schultze for the school's outlet. A caramelised onion tart made by Rai-Teree Dass and Cara Conway for sale in the outlet; the wine cellar is located under the house and contains Jackie's collection – guests will be able to store their wine there under lock and key. Elaine is involved in every aspect of the school, including the small cooking outlet that the students stock with home-made treats including, when we visited, naartjie curd, petit-fours, smoked butter, mini doughnuts, koeksisters and salted caramel. It’s sure to become a popular spot for locals to stop off on the way home from work, or for something special to treat guests on a weekend. 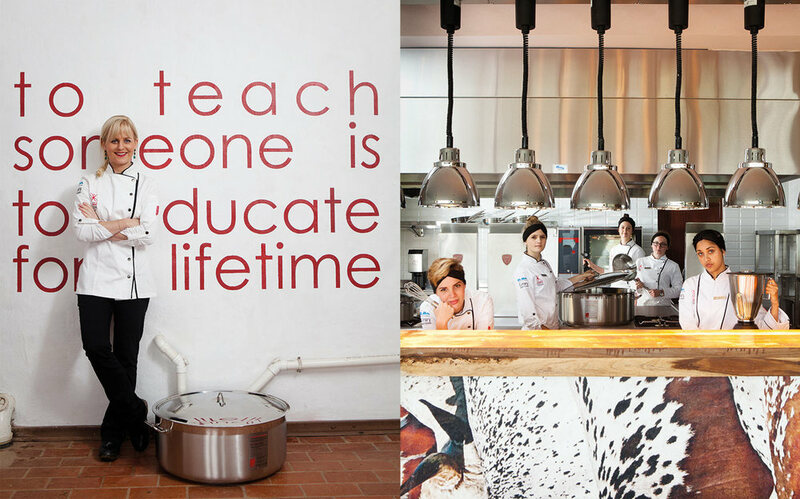 Jackie plans to offer short-term cooking classes tailor-made to the requirements of groups or individuals, and can host private cooking functions and events at the school, a perfect opportunity to have an award-winning chef at your service to create a memorable experience. She will also offer classes through the Weber Grill Academy, as well as teach people how to cook on gas in conjunction with Elba, along with courses using the Wonderbag, a portable, non-electric slow-cooker developed in South Africa. It’s an impressive set-up, one that promises to produce future chefs who are as meticulous about their chosen careers as Jackie is. It’s something quite special – in both the way in which it is equipped and the visible passion of its founder. In the words of young chef-to-be Carla: “Nailed it!”. 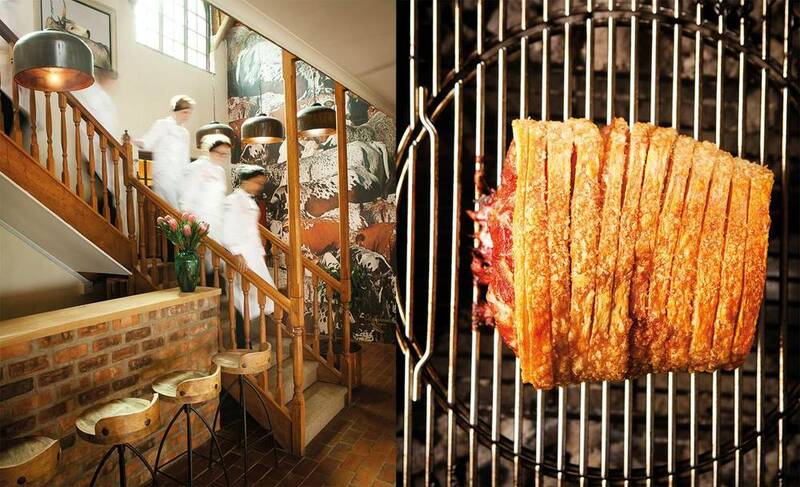 Short courses through the Weber Grill Academy will teach guests to cook perfectly crispy pork crackling; the students with a mural by Ed Schroeder in the background. Opposite: Pina colada cupcakes decorated with dehydrated pineapple. To make part one of the puff pastry, mix all the ingredients together, and shape the mixture into a 10 x 10 cm block. Wrap tightly in clingwrap and chill for 15 minutes. 2 To make part two of the puff pastry, sift the cake flour and white bread flour together. Add the butter and work it in using your fingertips to resemble breadcrumbs. Make a well in the flour and pour in the water, lemon juice and salt. Work in the ingredients to form a dough, trying to knead as little as possible. Shape into a ball, wrap tightly in clingfilm and chill for 15 minutes. Remove the part two pastry from the fridge. Make a cross on the top, but do not cut all the way through. Roll out each corner to form four extensions with a thick centre. Place the mixture from part one on top of the centre of the cross, making sure that it fits neatly on the cross. If not roll out the part one pastry a little more. Fold in the pastry extensions (one at a time) to snugly close and cover pastry part one. Flour a clean working surface. Roll the pastry into a rectangle (only rolling up and down, never to the sides), then fold the bottom corners of the pastry a third of the way up to the middle, then fold the top corners of the pastry down two-thirds, so they meet the bottom corners. Turn the pastry a quarter of the way so that the closed side is on the left. That counts as one fold. The pastry must be rested in the fridge for at least 30 minutes between each fold. Repeat the folding process six times. Take care not to add too much flour, brush any excess off the pastry using a pastry brush. Grease 1 x 22 cm tart tin and cut the puff pastry in half. Roll half the pastry to fit the tart tin, prick well using a fork and place the pastry lined-tin into the fridge to rest for 2 hours, or overnight. Freeze the remaining pastry for later use. Preheat the oven to 200°C. Blind bake the pastry for 20 minutes, or until cooked. Remove the baking beans and paper, remove from the tin and allow to cool. To make the basil pesto filling, place the basil, butter, olive oil, garlic and Parmesan into a blender. Add the pine nuts or kernels and blend until the correct consistency is reached, then season to taste. You will only need half this amount. Store the leftover pesto in an airtight sterilised jar in the fridge. To make the white caramelised onions, place all the ingredients into a heavy-based pan. Simmer until the onions are caramelised and the wine has reduced to a syrup. This takes about 35 minutes. Allow to cool. To assemble, cover the cooled puff pastry base with a thin layer of mozzarella, then spread with a thick layer of basil pesto. Add another layer of mozzarella, then top with the marinated artichokes, spacing them evenly. Add another layer of mozzarella, then top with the leeks. Top with a final layer of mozzarella and return the tart to the oven at 200°C for 15 minutes, or until all the cheese is melted and oozing. 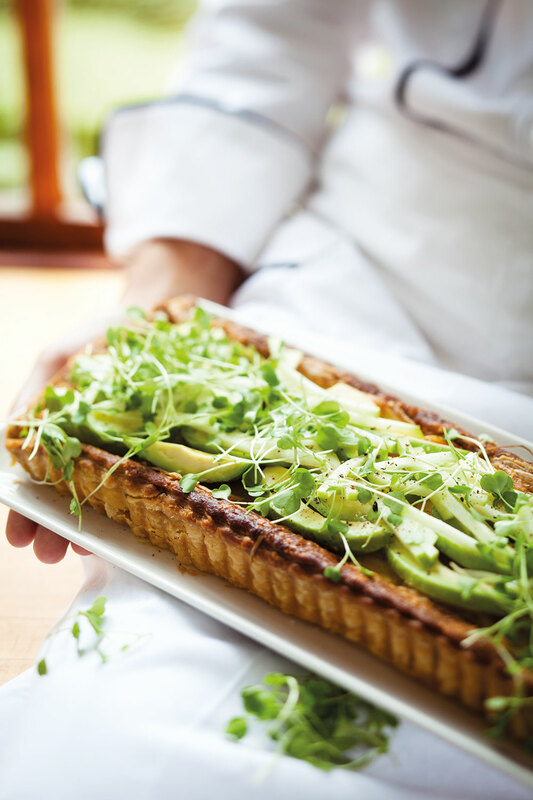 Remove the tart from the oven, then top with the avocado, apple and caramelised onions. Garnish with microherbs and season with freshly ground black pepper. Serve immediately.